We arrived at Sandstone at around 9:30am on Saturday to see Sandstone #4 (NGG16 113) and #1 (Barclay 0-4-2T) in steam. The Garratt was shiny clean in green livery, the Barclay blue. We joined the Garratt for a trip to Mooihoek, where the earthworks for the new extension to Vailima were evident. The Garratt ran around and took us to Grootdraai at the southern end of the line, where the Barclay was waiting on the balloon loop. On return to the station, it was time for a lovely lunch of boerewors rolls, potjiekos, tea and coffee while the crews services the locos. A Marshall steam roller was in steam and a couple of traction engines as well. One of these was hooked up to a vintage threshing machine (or maize header or something?) which was operated for a while - most interesting. We had a ride on the Barclay in the afternoon. The two locos were double-headed a bit later on, which gave us the opportunity for some nice late afternoon photography. Then back to Fouriesburg for a lekker braai and a cuppa sitting in front of an open fire - just the thing for the cold evening! A bunch of hardy (foolhardy?!) gricers were back before sunrise on Sunday morning for a photo session with the NGG16 and mixed train. The temperature was around the zero mark, and the slight breeze made it seem much lower. The Garratt had 4 DZ-type wagons with tarpaulins, one with two tractors in it then a passenger coach and a guards van. We waited for the sun to rise over the Maluti mountains for the first shots. The thin cloud made the light somewhat erratic, but I think some lovely shots were taken. We took the train south to the balloon loop and back with many runpasts and posings of the train for the right shot - very nice. Then time for brekky and a look in the new undercover workshops which are taking shape nicely. There are a few other restoration projects in the pipeline as well. Also very impressive was the team of trek oxen that were spanned in to a wagon, being put through their paces. 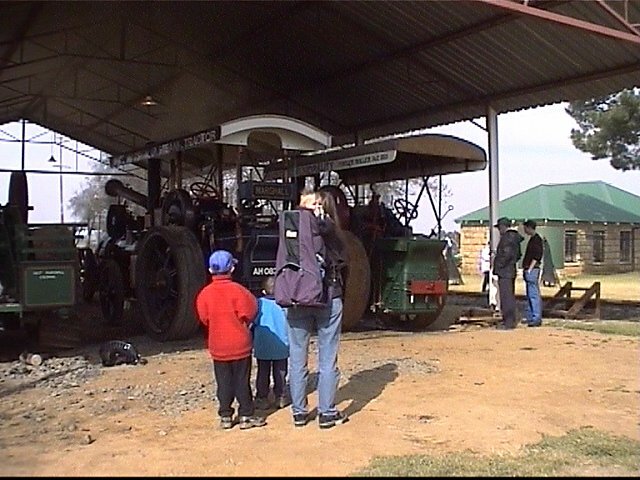 Whilst we wandered around, another traction engine was moving around the place and we also took a tractor tour around the farm. Plenty of stuff happening! The collection of vintage tractors there was amazing - I see from the flyers being handed out that Sandstone are keen to contest the record for the number of tractors working simultaneously again. The previous record of 100 set at Sandstone during The Great 100 Working a few years ago was broken by the Aussies with 300-odd tractors. Now Sandstone are planning The Great 400 Working! Should be quite a sight! Thanks Gabor, Shaun and the rest of the folks at Sandstone for an excellent weekend. When's the next one? !